The Lotto Black Book is said to be a real lottery winning system used by many real lottery winners, do you really believe this is true? We have thoroughly and fully reviewed this Lotto Black Book system and have found their system claims are highly suspect. We see many reviews telling of the great winning potential the system gives, then on the other hand we see reviews that claim the system is full of misleading advertising, just used to sell a non-winning system. After our in-depth Lotto Black Book review, we can conclude that the system is not what it claims to be, it is more of a gimmick than any serious lottery winning program. Lets take a look at some of the systems major claims. The Lotto Black Book is written by a mathematics professor Larry Blair. The system is a unique as it is created by an actual lottery winner, who claims to have won three lottery jackpots in a row. You will learn to pick your lottery winning numbers just like actual lottery winners have used to win big. You will never have to over analyze lottery numbers, just use the proven numbers that system gives. The Lotto Black Book formula was wanted by thieves so bad they shot the math professor Larry Blair to steal his system secrets. OK, there are more claims about the system, but I think these will do just fine. I will reveal the truth about these claims. The Lotto Black Book is nothing special, all information it reveals is found online and is most certainly not written by any math professor, more like a sales person marketing a product using unscrupulous methods. The Lotto Black Book is not unique in the least and there is no proof of any substantiated evidence of any kind, that shows the systems creator has won any lottery jackpots. We also concluded, their are no real lottery winners at all who have used this very misleading system. Now get this! There was no shooting the leg of Larry Blair incident at all! That was investigated and proved to be total rubbish! The only thing we like about this Lotto Black Book system is the name, that’s it! We are not alone on this issue, most every lottery system review site is also reporting the system as phony. Do you realize where all these so-called good Lotto Black Book reviews are coming from? It is by the many affiliates selling the heavily advertised system for commissions and they will tell you want you want to hear so you buy the system, which is very sneaky. Here is great solid proof the Lotto Black Book is pulling your leg. 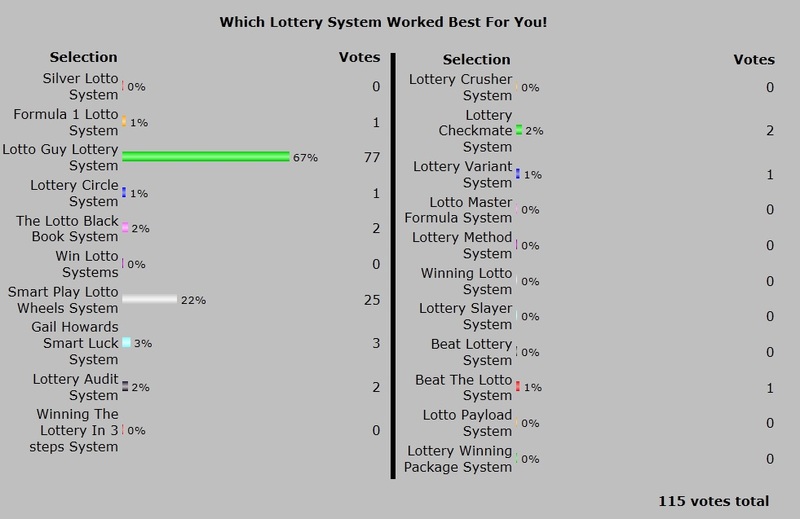 You want to see which lottery systems real lottery winners voted on as best winning systems? Take a hard look at the lottery system poll below, it shows you first hand which lottery systems real people voted on. High votes equal good winning system, low votes equal poor winning system right? See how the Lotto Black Book did, it fail to get higher than two votes, case and point! More reviews on the Lotto Black Book can be found at top lottery system review sites, see Lottery Systems Reviews or you can review the many other websites, blogs and so on that are also reporting the system as a crock of nonsense. We have fully exposed this system so people will know the real facts, before they fall for the phony scenario, false claims, even the phony testimonials used by the Lotto Black Book, if have not already been removed as the system was caught using them. Real Winning systems such as the Lotto Guy Lottery System are actual systems used by real lottery winners and are very highly recommended, so good systems are out there, just choose wisely! You can browse these lottery websites and reviews below, they can help you choose a real winning system.